I try to minimize the overt pop-culture references because the in-comic time moves a LOT slower than real-time. I started the comic in 2010, which means right now it is still loosely set in 2010. I mention this because Kenny is in for a sad sad day at the next Super Bowl. I hope she finds a way to talk about this to someone- Tod or her other relatives and they give her the support she needs. I know that look, she’s been made to feel sorry for an enemy – and she doesn’t know what to do with that. Gridiron? Booo. Real fans call it FOOTBALL! Real football fans call it HANDEGG. Just wondering (pensive? ), as you brought up Harry Potter references, were the Buffy references intentional? And if so, is it the vegetables in the double meat specials that make her go all giddy?! I never watched Buffy. Heard good things but just never got to it. Giddy had me for a moment. Not a word I’ve ever used. I was thinking “a physical effect, from eating all that meat”, like maybe a physical effect from drinking a few too many beers. But I believe it’s the joyousness of getting more. Was that the first day of school strip? “Tuna or chicken?” “Cans I haves boths?” “Sure” “Yaaayy”. And she’s not “Yaaaayyy”ing about getting two steaks. I’m pretty certain there is not an E on the end of “who’s”. Makes much more sense now. Buffy was just the first thing that came to mind when I saw ‘double meat’ (as in Doublemeat palace) following steaks (stakes). Well, it doesn’t detract from the story. I don’t know anything about your crazy sports, but you’ve included enough in the comic for me to know what’s being discussed, and how the conversation’s going – friendly taunting. I’m loving the facial expressions in this one. Not just Selkie’s, Todd’s as well. Awww. I really hope Heather and Selkie can be friends from now on. Hi! I really love this story. But one thing on the drawing: when an arm is straight down, the fingertips should fall about halfway between the top of the leg and the knee. I know proportions are a pain. Now I’m curious. What is the Harry Potter joke you were considering using? It’s ok if you don’t want to spoil it if you plan on using it later. I’m just wondering. Kind of fumbly and mood-breaking, so I didn’t use it. I think the word you’re looking for from Potterverse is “pensieve”. I know it’s pronounced almost same, but at least in spelling there’s a difference. I think Dave knows that, but Selkie wouldn’t. That would be the joke. Absolutely. 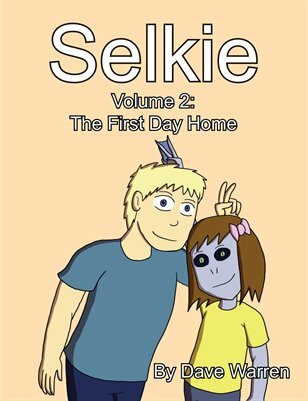 Like Keesha’s “Cheese and rice” https://selkiecomic.com/?p=183 kids hear what they THINK was said, and not necessarily what WAS said. Well, if you think of the normal steak dinner, the meat is only half (if that) of the actual meal, so for Selkie to get a full meal’s worth, she’d need two. I think Alpo has the gist of it – usually being told she’s getting twice as much steak as usual would make Selkie “giddy”, or just really happy and excited. Since she’s NOT responding like that, Tod – perceptive new dad that he is – is asking if anything’s wrong. One of the toughest lessons to learn, child or adult, is that the people that p**S off the most usually have something really bad in their lives. It doesn’t excuse their behavior, but it helps us understand where they are coming from. Selkie and the rest of the kids are too young to have to deal with this sort of thing. No wonder our society is messed up, we are never allowed to be kids anymore. I have one small problem with this comic: time. I don’t see time passing, I have the impression he adopted Selkie one day, next day her first class (with the shirt problem). Then top 1 day and lunch at grandma’s house, then today. It’s just me with this problem? other than that, I love this comic. I’m reading since the beggining.